Supplier Label - Supplier ensures this label is on all their "Controlled Products". Workplace Label - This will be created by someone in the workplace. 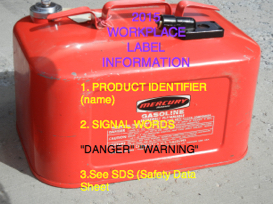 There is a minimum amount of WHMIS / GHS information that MUST be on it. 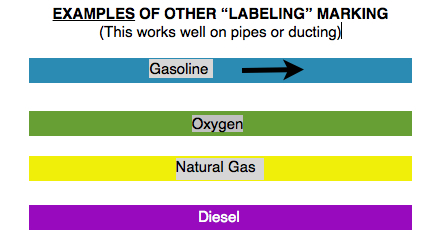 Other Labels (at workplace) - These are labels or markings specific to that (your) workplace only. The 1988 WHMIS Supplier Label's border is hatched and may be any colour. 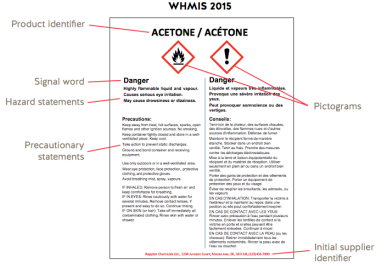 The 2015 WHMIS Supplier Label's border is solid..
4. A brief standardized statement of all hazards based on the product (#1) hazard classification. 5. These statements state recommended steps to take in order to minimize or prevent, adverse effects from harmful exposure to the product. This will also include protective equipment (PPE) and emergency and first-aid measures. 6. 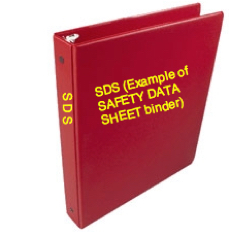 The name address and contact information of the company that made, sold, or imported and is responsible for the classification and supplier label and SDS. These coloured "bars" represent pipes or ductwork that a worker may see in their place of employment. The actual colours may be ANY colour the company wishes to use, however, those colours MUST be standard for the complete workplace. The ductwork may or may not have actual words written on them - maybe just the colour coding. Arrows are helpful too. IT IS THE EMPLOYER'S RESPONSIBILITY TO CONDUCT "IN-HOUSE" TRAINING TO ENSURE ALL WORKERS LEARN AND UNDERSTAND THE SPECIFIC WHMIS HAZARDS AND POLICIES FOR THAT SPECIFIC WORKPLACE.